The Christian High School Patriots ended the 2013 prep football season with one of those proverbial once in a lifetime experiences, as the small enrollment East County school knocked off a team with five-times the student enrollment to capture the San Diego Section Division III championship title. The Patriots were back in action last weekend, July 11-12, at Southwestern College as part of the 32-team eighth annual South County passing tournament. While head coach Matt Oliver isn’t predicting a championship repeat at this time, his upcoming 2014 team does look like it should represent itself very well on the gridiron. The Pats won all their of their pool games on July 11 in resounding fashion—defeating, in order, Division IV champion Sweetwater (42-7), Division I mainstay Otay Ranch (42-6) and Division V runner-up Crawford (52-13). Christian returned to action the next day to defeat Chula Vista, 46-6, in the opening round of the playoffs and then eliminated Horizon Christian in the next round to improve to 5-0 in the tournament. 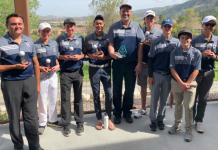 The Patriots’ run ended with a loss to Steele Canyon in the winners bracket quarterfinals; Steele Canyon went on to defeat Castle Park in the semifinals to draw a championship-round pairing against defending Division I champion St. Augustine. St. Augustine emerged as the top team in this year’s passing tournament with a hotly contested 33-30 victory against the Cougars. Mira Mesa defeated Kearny, 31-2, to win the consolation division. Christian will return to the Division III playoff tier this year to defend its CIF title; however, the placement of smaller schools in upper tier divisions has created controversy in terms of qualification for the state playoffs at a school’s normal student-enrollment level. Christian has an enrollment of less than 400 students but faced San Marcos, a school with more than 2,000 students, in last year’s Division III finals, winning 19-7. Because the Patriots won the Division III section final, it was ruled they could not to drop down to the Small School Division for the state playoffs. 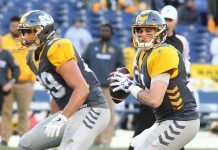 The Patriots have most of their wide-outs returning to provide experienced targets for new quarterback David Jeremiah, who appeared to pass his first big test heading into the preseason. Jeremiah joined the team as a freshman in 2012 and saw action in five varsity games last year as a sophomore with one touchdown pass. Steele Canyon finished 3-8 last season, dropping a high scoring 56-35 quarterfinal-round decision to eventual division champion Mission Hills in the section’s inaugural Open Division playoffs. 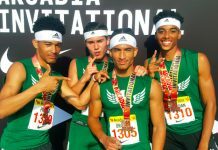 The Cougars’ record was somewhat misleading, however, as the Men of Steele dropped six games by margins of three or fewer points, including a 14-13 contest to Grossmont Hills League superpower Helix. 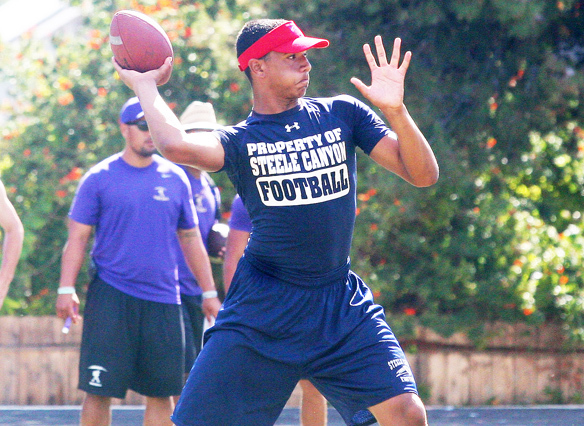 Steele Canyon finished last weekend’s passing tournament with a 6-2 overall record, including pool victories against Palo Verde (46-34) and Bonita Vista (22-14) and ensuing playoff wins over Coronado, Horizon, Christian and Castle Park. Cougars coach Scott Longerbone praised his team for its tournament showing, especially after taking a late lead in the championship game against St. Augustine before eventually bowing to the Saints in the final minute of play. Dominic Anderson led the Cougars at the quarterback position last weekend. Longerbone said he expects good things from his team this season. The Cougars kick off the 2014 season with a non-league game Aug. 29 at Chula Vista. St. Augustine finished 8-0 to grab top honors in the South County passing tournament for the second consecutive year. Last year, the Saints defeated arch rival Cathedral Catholic in the championship game. St. Augustine defeated Mission Bay, 49-0, to win last year’s Division I section title. The Saints appear to have reloaded in fine fashion under full-time varsity quarterback Tommy Goodridge. Sparkplug Elijah Preston is also back. Preston rushed for 1,481 yards and scored 17 rushing touchdowns last season as a sophomore. The Saints topped Mater Dei Catholic, Montgomery and Kearny in pool play and then defeated Otay Ranch, Cathedral Catholic, Bonita Vista, Torrey Pines and Steele Canyon in the playoffs. St. Augustine enters the season ranked 15th nationally by National Sports Report. The Saints kick off the 2014 campaign with a high profile non-league game at Oceanside on Aug. 29 and then play at Madison and Loyola in successive weeks in other top-level contests. Goodridge appeared in nine games last season behind varsity starter Joe Joe Hudson, who passed for 1,666 yards and 16 touchdowns. Goodridge passed for 188 yards and one score in limited duty in 2013. “This year we’re handing the ball to Tommy just like we handed the ball last year to Joe Joe,” Sanchez noted. Four teams have switched leagues to highlight changes in the Grossmont Conference football ranks for the upcoming season. The Grossmont Valley League now includes El Cajon Valley, Monte Vista, Santana, Granite Hills and West Hills. The Grossmont Hills League now includes Grossmont, Helix, Steele Canyon, Valhalla, El Capitan and Mt. Miguel. approximately this subject for ages and yours is the best I have found out till now.